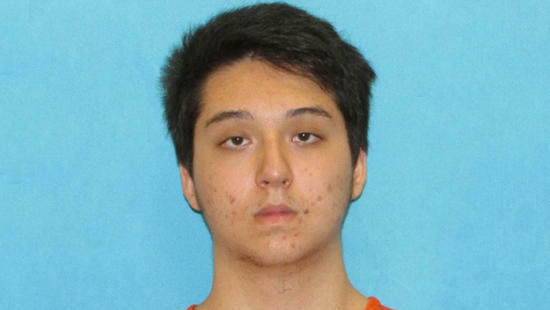 DALLAS -- A suburban Dallas teenager accused of planning a mass shooting at a mall inspired by the Islamic State terror group has been charged with terrorism. The Collin County district attorney's office says 17-year-old Matin Azizi-Yarand of Plano had planned to release a "Message to America" explaining his reasons for the attack. Azizi-Yarand is charged with criminal solicitation of capital murder and making a terroristic threat. He is being held Wednesday at the Collin County jail on a $3 million bond. Online jail records don't indicate that he has an attorney. He faces life in prison on the criminal solicitation charge alone. The shooting at the Stonebriar Centre in Frisco was allegedly planned to happen sometime in May, reports CBS DFW. Azizi-Yarand is said to have spent $1,400 on weapons and tactical gear for his alleged attack. Law enforcement officials have obtained the Plano High School student's "manifesto" in which he allegedly pledged allegiance to ISIS. Authorities said that Azizi-Yarand was also trying to solicit others into joining him in the mass shooting spree, though affidavits suggest that he wanted to be a "lone wolf." The FBI says they are not aware of any additional threats following the arrest. According to an affidavit obtained by the station, the case began in December 2017 when Azizi-Yarand started communicating with an FBI source in a mobile messaging app. Azizi-Yarand allegedly expressed his desire to commit an attack, adding that he had been reading ISIS guides for "performing operations and making bombs." Azizi-Yarand had reportedly also been reviewing a guide to making pipe bombs which was authored by Eric Harris, one of the attackers in the 1999 shooting at Columbine High School. "This case exemplifies the wide reach terrorist groups have through social media and other means to radicalize others in communities across our country," said Chief Gregory Rushin of the Plano Police Department. In his earliest conversations with the FBI's source, Azizi-Yarand allegedly said, "It is not about how many kill, but how much money you will make these countries spend in security just for a simple attack… although having a high number will get their attention." "I want to put America in the state that Europe is in, which is having to have soldiers deployed in streets," Azizi-Yarand said, according to an affidavit. "Something that will cost them a lot financially too." In multiple conversations with the FBI's source, Azizi-Yarand allegedly said that he hoped to travel to Pakistan, and then cross the border into Afghanistan in order to officially join ISIS. He also allegedly said that he would use the mobile messaging app to find others who could help him with an attack. Azizi-Yarand invited the FBI source to Dallas late last year, officials say. "There is a Hindu temple I want to shoot up," the suspect allegedly said, asking for help. "Get some crappy car and ditch it somewhere. Police response time here is really slow." He allegedly said that he was waiting until he obtained a "proper gun" to commit that shooting. The suspect then began speaking with an undercover FBI agent in January 2018. Azizi-Yarand allegedly told the agent and the FBI source that he had two other men who were "serious about this," but he was waiting until he turned 18 so that he could buy guns. Azizi-Yarand's birthday is in November. Azizi-Yarand was said to be in contact with an ISIS member, who told him, "guns are simple, just open fire" when the suspect expressed concern about being untrained. "How hard can it be to spray down a big crowd of people? Las Vegas the dude was just blind firing. And got 100." When looking into potential targets, Azizi-Yarand allegedly also considered a school. "School is a perfect place for an attack. Crowded and close quarters," he said. "Even a blind man could take 10 easily. Just fire where u hear screams." However, the Stonebriar Centre appears to have been picked as the target in March. Azizi-Yarand allegedly told the FBI source that he had been observing the layout of the building, the number of security officers there, and the regular movements of the shopping mall's patrons. He allegedly also planned to set some stores on fire. "I'd actually like to make a cop surrender and drop his gun," Azizi-Yarand allegedly said to the FBI source. "Then, douse him with gasoline and burn him. Record it." If he is convicted, Azizi-Yarand could face up to life in prison for criminal solicitation and up to 10 years in prison for making a terroristic threat. His bond has been set at a total of $3 million.